This is a great raw corn salad recipe that I enjoy. It's easy and quick to make but quite satisfying. Ingredient freshness is key. Corn should be eaten very soon after its picked because right after being harvested the sugar in corn starts turning to starch. Within 24 hours its lost 25 percent of its sugar, and consequently, much of its taste. Its best to get corn right from the farm, or at least from a seller who can speak for its freshness. 3 cups cucumber (you may wish to peel them). 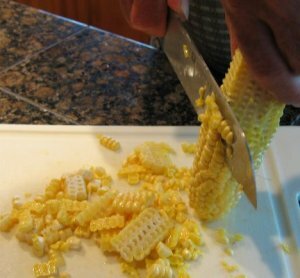 Cut the kernels off the cobs. Dice the cucumbers, celery, and tomato. Toss with finely chopped parsley and (optional) add additional spices like rosemary, mint, or basil, to taste. Learn how this corn salad recipe fits into a healthy raw food diet. Find other awesome raw food recipes. Get the eight best raw salad dressings I know how to make.